Shishamo (Japanese: ししゃも) is a small fish as you see. This fish seems to be captured only near Hokkaido in Japan. In fact, I also learnt now. 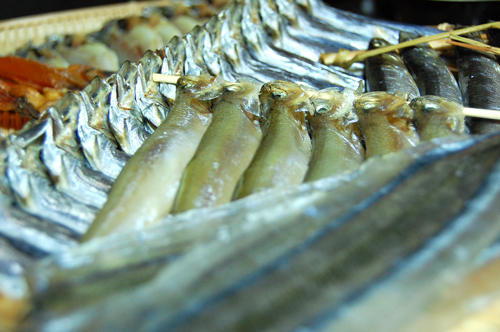 Shishamo is a “Otsumami” which is kept being loved from the first stage of the izakaya. It is like an atttendant of tired salary-men (Japanese businessmen) from work. They drink sake the relish of shishamo and pickles in the izakaya in which it stopped on their way home.That is a stereotype image of salary-man. Shishamo maches to sake very much because of just the right amount of salt and fragrant flavor of it. The combination Shishamo and crispy taste of dry sake is wonderful! And it is also very delicious that the roe that be able to be harvested only at the best time of the year. I’m sure you can understand it if you try only once. We can eat shishamo from the head to the tail because their bones are soft. To be salted and dried overnight is better. I recommend the way to eat is freshly grilled shishamo with a little soy sauce and lemon juice. But it’s good with a red pepper in the mayonnaise!